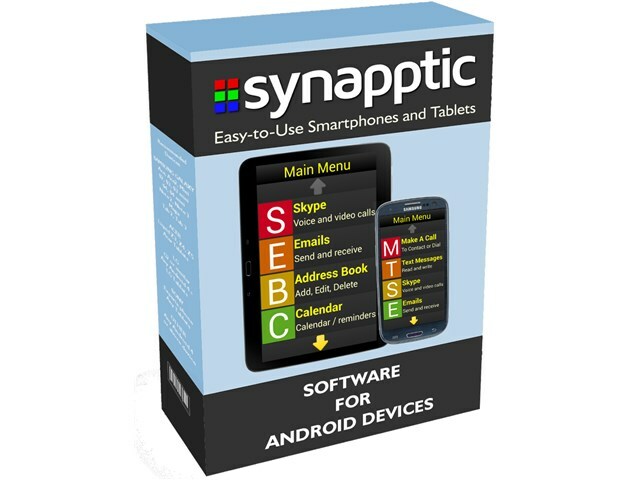 Synapptic Software is an award-winning, all-in-one package for people with sight loss that works on Android smartphones and tablets. Complete all your everyday tasks – like calls, texts, browsing the Internet and catching up with TV programmes you’ve missed – whenever and wherever you are. 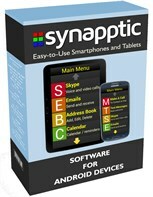 Synapptic is intuitive to use, with simple menus and easy navigation features. It’s ideal if you’re a novice when it comes to technology, you lack the confidence to give it a try or you find it difficult to use accessibility on other devices. So what are the benefits of using Synapptic software? An all-in-one package, so there’s no need for separate devices. Includes human-sounding speech and magnification on every screen, so it’s suitable for any level of sight loss and can evolve with you if your sight changes. Simple, clear menus, with bold icons make products intuitive to use, even if you’re new to technology or lack confidence. The Touch and Release feature means you can simply slide your finger up and down each menu option and release it on the option you want to use. Voice recognition if ever you need to type text or you’re not confident at using a keyboard. An in-built digital magnifier makes it easy to magnify menus, timetables or food labels when you're out and about. An in-built Reading Machine means you can photograph and read any written text, which you can then translate into speech, or save as a document to be read or spoken out later. Control your device with just your voice - select menus, dial numbers, write text messages, compose emails and lots more – to complete tasks quickly and easily. Smart yet simple internet browsing makes it easy to do online shopping, banking, or access any information at your fingertips. One address book for all your contacts: keep telephone numbers, email, Skype and postal addresses in one place. Easy access to social media means you can stay connected with friends and family. Share photos using our talking camera and attach photos to emails at the touch of a button. Listen to a massive range of national and international internet radio stations and music tracks or books you’ve saved. Watch Freeview Digital TV Channels or catch up with BBC iPlayer (and selected audio described programmes). Includes one hour of free telephone training, two years of free Software Updates and free lifetime UK-based technical support.